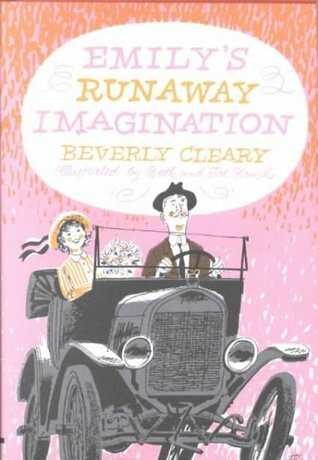 Emily’s Runaway Imagination is a work of historical fiction set in the 1920s, written by Beverly Cleary in the 1960s. The story is set in the county of Yamhill, Oregon, where Cleary herself grew up. Though each chapter is its own episode, the overall theme that ties everything together is the creation of the town library by Emily’s mother - which is based on Cleary’s mother’s own involvement in establishing a library for their very small town. In this mostly cheerful book, Emily does such things as bleaching a horse’s fur, riding in an automobile, attempting to bake a flaky pie crust, and avoiding her Chinese neighbor Fong Quock after she embarrasses herself by correcting his pronuncation one day on the street. At every turn, Emily’s imagination runs away with her, bringing lots of excitement into the ordinary everyday life of a farm girl. I didn’t realize that Beverly Cleary had ever written any historical fiction, so this book was a pleasant surprise. I also enjoyed the fact that the story is at least partly autobiographical, especially knowing that Beverly Cleary grew up to be not just a children’s author, but a librarian too. It’s neat to see how real life influences her work, and of course, as a librarian, it’s interesting to think about the process of establishing a brand-new library for a small town. I really enjoyed reading of Emily’s persistence in helping to raise money for the library, and I related to her desire to read that one book she just can’t get her hands on, which in her case is Black Beauty. Readers looking for upbeat and uplifting historical fiction that dwells on the fun of living rather than the many tragedies that befell our ancestors will enjoy this book immensely. Some might have trouble swallowing Fong Quock’s language barrier, where he pronounces Rs as Ls, but I actually think Cleary is pretty respectful of his character, and that her description of his speech pattern is a product of the time in which she was writing, and not the result of any desire on her part to poke fun at him. Fong Quock actually becomes quite a hero in the book, and he adds a bit of cultural diversity to the story that is otherwise strongly lacking. Though this is not Cleary’s best-known work, it is every bit as well-written as the beloved Henry Huggins and Ramona books, and it gives readers a stronger sense of her varied talents as a writer. The episodic nature of the book makes it a natural choice for classroom or bedtime read-alouds, as each chapter comes to a natural conclusion that does not leave the reader hanging. Librarians everywhere should also read this book, if for no other reason than to see a new library coming together to benefit a community in need. Though it might be buried on the shelves among a thousand copies of the Ramona books, this book is worth hunting down and reading. Most readers old and young will find their imaginations running right alongside Emily’s, enjoying every moment of her story.